In a conceptual show that combines 2-D, 3-D, and installation work, Leslie Vigeant explores the impossible standard of female beauty and the lengths to which women contort themselves to attain it. A perfect knot of synthetic flaxen hair sprouts from a Miracle Grow container under a sickly pink florescent light in the sculpture “It’s a Miracle! Blonde.” Nearby, a tangle of iPhones grows from a floor outlet against a vinyl backdrop of a digitally composited forest that could never exist in nature. The phones play looping gifs, taken from social media, of women painting, injecting, and peeling their faces — altruistic tutorials to help other women erase their natural beauty. 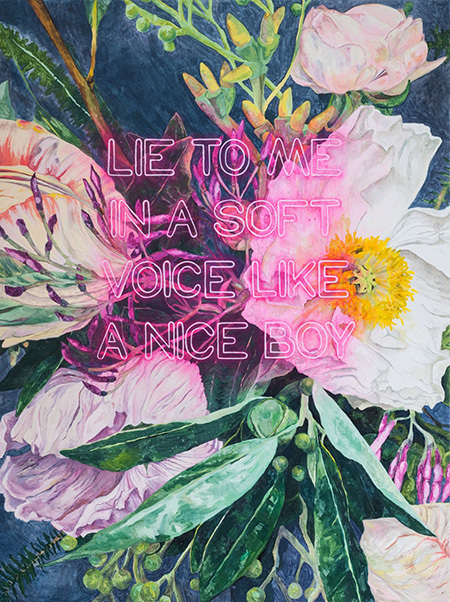 Vigeant demonstrates her skill as a painter with a large-scale still life in which beautifully rendered flowers open for us behind glowing pink letters that read: LIE TO ME IN A SOFT VOICE LIKE A NICE BOY. By putting together a series that is simultaneously hilarious and heartbreaking, challenging and accessible, Vigeant succeeds at doing something few artists can manage.